WASHINGTON (Reuters) – U.S. 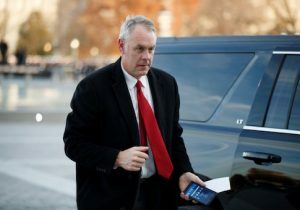 Interior Secretary Ryan Zinke, who has sought to open U.S. offshore waters to oil and gas drilling despite environmental protests, will be leaving his post at the end of the year, President Donald Trump tweeted on Saturday, the latest high-profile departure from his administration. Trump did not give a reason for Zinke's departure. However, the former Navy Seal and ex-congressman from Montana has faced multiple probes into his use of security details, chartered flights and a real estate deal. "Ryan has accomplished much during his tenure and I want to thank him for his service to our Nation," Trump said on Twitter. "The Trump administration will be announcing the new secretary of the Interior next week," he added. Zinke, 51, was among Trump's most active Cabinet members, cutting huge wilderness national monuments in Utah to a fraction of their size and proposing offshore oil drilling in the Arctic, Pacific and Atlantic. He became a darling of the U.S. energy and mining industries and a prime target for conservationists and environmental groups. Critics also questioned Zinke's ethics and some of his moves triggered government investigations. Senate Democratic leader Chuck Schumer applauded Zinke's departure in a tweet: "Ryan Zinke was one of the most toxic members of the cabinet in the way he treated our environment, our precious public lands, and the way he treated the govt like it was his personal honey pot." "The swamp cabinet will be a little less foul without him," Schumer said. There are two other continuing investigations of Zinke’s conduct. Interior’s watchdog is examining whether the department purposefully redrew the boundaries of Utah's Grand Staircase-Escalante National Monument in a way that would benefit a state lawmaker who owns adjoining property. The watchdog also is investigating Zinke's decision to block casinos proposed by two Connecticut Native American tribes. Critics allege he made that move, overruling his staff's recommendation, shortly after he met with lobbyists for MGM Resorts International, which owns a new casino in the region. Earlier this year, Interior’s inspector general wrapped up two other investigations relating to Zinke's travel expenses. Those probes found that a $12,000 private flight he took after a meeting with a professional hockey team could have been avoided and that the security detail he took on a family vacation to Greece and Turkey cost taxpayers $25,000. Trump said on Nov. 5 that he would look at the allegations. Previously, the president had repeatedly praised Zinke's performance at Interior. Others include Attorney General Jeff Sessions, who resigned on Nov. 7 after months of criticism by Trump for recusing himself from a federal investigation into whether Trump’s campaign colluded with Russia during the 2016 election.